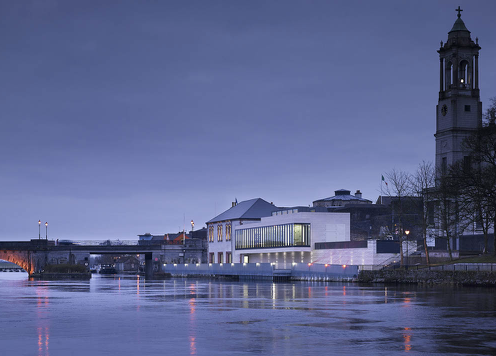 Keith Williams’ Luan Art Gallery in Athlone, Ireland has been awarded a Civic Trust Award. The award was announced at the 55th Civic Trust Awards ceremony held at Blackpool’s Winter Gardens, on Friday 7 March, an event supported by Blackpool Council and hosted by architect, writer and TV presenter George Clarke and Civic Trust Awards Managing Director Malcolm Hankey. The Civic Trust Awards is one of the only remaining independent built environment awards schemes, not linked to any organisation, institution or publication and operates on a not-for-profit basis. From 238 applications, just 39 national and international projects including the Luan Gallery received a Civic Trust Award, whilst a further 40 projects received either a Commendation or Community Recognition. The Luan Gallery, which has already won the RIAI (Royal Institute of the Architects of Ireland) Best Cultural Building Award 2013, continues to receive recognition of the highest order as a testament to its architecture and design.